RiaNovosti in Russia recently interviewed Devens Medical Center spokesman John Colautti about Dzokhar Tsarnaev's conditions of confinement. 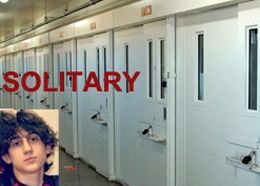 Jahar is locked down 23 hours a day 5 days a week and 24 hours a day on weekends. He has no TV. He could listen to a walkman radio if he had $45 to buy it. His meals are brought to his cell. A book cart is brought by his cell a few days a week. He eats every meal alone in his cell. He gets three showers a week -- in his cell. He's not allowed contact with other prisons. Even if his injuries improve and he is moved to another facility, it's unlikely his living conditions will be any different -- he'll be deemed to be a "celebrity" inmate who needs to be segregated from general population. This could easily go on for a year. The only people he sees besides medical staff are his lawyers, and they are 30 miles away. He still can't have visitors because it takes a while. He has to submit the names of visitors -- they have to be people he knew before being arrested -- and then a thorough background check is done on them. His cell is about 10 feet by 10 feet and contains only a bed bolted to the floor, a sink and a toilet. When he is taken out for exercise, he is shackled at the hands and feet by two guards, and brought to a cage type place outdoors where he can exercise. If weather is inclement, there's an indoor room where he could exercise alone. If the prison gets put on lockdown, or staff is short (e.g. from furloughs), he doesn't get to go.